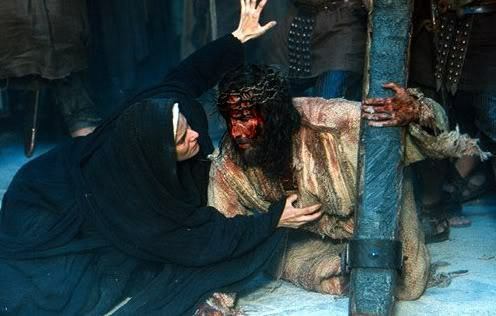 “Behold, I make all things new.” Scene from The Passion of the Christ. In our gospel reading (Jn. 13:31-33a, 34-35), at the Last Supper after our Lord had just washed the feet of his disciples – showing by action what he is to now proclaim in word – Jesus says, I give you a new commandment: love one another. By holding these passages together – letting them inform one another – I think that we can say that the new heaven, the new earth and the new Jerusalem are intrinsically linked to the new commandment that is given to us. God has chosen to “make all things new” precisely through the love revealed in Jesus Christ. God does not choose force or fear or power or might to accomplish his purpose rather, God chooses loves because, as Scripture says, God is love. It is helpful to note that Jesus reveals this new commandment only after Judas had left. Judas had made up his mind to betray the Lord. Judas had chosen to remain captive to the sad logic of this world that chooses to only see things in terms of conflict, division, power and isolation. Judas could not take in the truth of God’s way and of the very nature of God that our Lord reveals. Judas was blind. The sad logic of our world continues to remain blind and cynical to the ever newness and possibility of God’s love. “Life is ever the same, look only to your own needs, nothing can ever be different.” This is the sad logic of our world. In the resurrection, the risen Lord breaks this sad logic just as surely as he breaks the chains of sin and death. We must realize that this commandment of love is not of our origin nor our making. On our own we cannot arrive at it. On our own we cannot even dream of it or imagine it. This new commandment of love comes from Christ and is in fact, Christ. Christ present in our lives calls us to an ever new awareness and an ever new living of love. I give you a new commandment: love one another. As I have loved you, so you also should love one another. The truth of these words need to sink into the depths of our hearts: as Christ has loved us … as Christ has loved us … as Christ has loved us … we should love one another. Fr. Robert Barron begins his series on the Seven Deadly Sins and the Seven Lively Virtues by highlighting a profound spiritual truth. The truth is this: we are not necessary. We do not have to be. The world and creation existed before we came on the scene and it will continue after we have exited the scene. We are not necessary nor, in fact, is all of creation. It is only when we wrestle and grapple with this profound and sobering truth that we come to recognize that the one necessary is God himself and everything else is contingent upon God. The good news? The new commandment? God is love. We are here, all of creation is here, only through the continual and generous outpouring of God’s love. When we recognize this and are able to step away from the isolation of the self-absorbed ego then we can live in and even be a conduit of God’s own love. The more we love one another as Christ has loved us, the more we participate in the very newness of God’s love which overcomes death, sin and the sad logic of our world. This is why the gospel can proclaim “blessed” those persecuted, mocked and derided for their faith in Christ because it is in the very face of the sad logic of this world that we are afforded the opportunity to love as Christ himself loves and that we ourselves can therefore participate in the very life of God who alone is necessary. St. Thomas Aquinas defined love as “willing the good of the other”. There is a lot to this definition that can be fleshed out in a variety of ways but here I just want to highlight a couple of truths. God in Christ has and continues to fully love us. God, in Christ, wills our good. God did not have to come to us when we were lost in sin and death but because God is love, God willed our good. God came to us and took on the weight of sin and death. Love is willing the good of the other. Here is the other truth. When God wills it is accomplished. We are not God, we are creatures. We are not necessary. When we love, when we will the good of the other, that does not necessarily mean it will come to be but this is okay because whenever we will the good of the other in whatever way or shape or form then we ourselves are participating in that very movement of the newness of God’s love. I offer this because we all often hear one another say, “My spouse, my child, my friend, my sister, my brother is making really bad choices. I love him or her but he or she does not change no matter how I try to help.” “There is so much pain and hurt in the world. I will try to do my part to help but what good does it really do?” It is not on us to accomplish (that is God’s part). “Behold, I make all things new.” proclaims the One sitting upon the throne. It is only on us to will the good. When we love, when we will the good of the other, no matter how small and insignificant it might seem, then we are participating in the ever newness of God’s love and we are moving beyond the sad logic of our world. At the end of her life, when my mother’s body had pretty much given out on her, my mom could not do much but one thing she could do was watch the finches come to the bird feeder at her window. When the feeder ran out she would remind me to fill it with new seed. In her own little way, my mother was loving and willing the good of those little birds and God’s creation. At the very end of her life, she was making the choice to participate in the ever newness of God’s love and not be bound by the sad logic of sin and death. The Lord said, I give you a new commandment: love one another. John heard the One sitting on the throne say, Behold, I make all things new. Pope emeritus Benedict often remarked that he thought it was not so much atheists who damage the Christian faith as it is the “practical atheists” who do the real damage. The “practical atheists” are those who profess themselves Christians but who then live as if God does not exist. At the heart of this practical atheism which is very present in our day and also very easy to fall into is an in-authenticity of relationship. 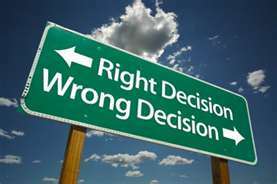 We say one thing yet we do another and we convince ourselves that no one is the wiser; including God. Today is Good Shepherd Sunday when we, as Church, reflect on the truth that the risen Lord is indeed the good and beautiful shepherd who came to seek out and save the lost. But here is the rub: we cannot reflect and proclaim the Lord as Good Shepherd and ourselves remain in-authentic in relation to him. To proclaim Christ as the Good Shepherd demands an authenticity of relationship on our part. This authenticity of relationship is witnessed to us in today’s gospel (Jn. 10:27-30) – the relationship of us and the Lord and the relationship of the Son and the Father. Jesus said: “My sheep hear my voice; I know them, and they follow me…” The movement of authentic relationship begins with our Lord. When we were lost in the darkness of sin and death, God came to us. God became incarnate and took on the full weakness and suffering of humanity. God took on everything except sin. “I know them…”, says the Lord. Christ can authentically say this because it is true. “My sheep hear my voice … and they follow me …” There are two parts for authenticity of relationship on our part. One, we hear the voice of the Good Shepherd and two, we follow. To say we hear the voice and then live as if the voice does not matter is not authentic. To proclaim Christ as the Good Shepherd means we must continually “tune” our ears to the voice of the Good Shepherd, we must trust and we must follow. This gospel passage also reveals the wonderful authenticity that makes up the relationship of the Father and the Son. Christ (in reflecting on the deep and abiding security of the sheep entrusted to his care) says, No one can take them out of my hand. My Father, who has given them to me, is greater than all, and no one can them out of the Father’s hand. The Father and I are one. Our Lord, as Son, is expressing his gratitude for what the Father has freely given him. Authenticity of relationship finds its fullest expression in gratitude for what is freely given rather than in using the other for ones own need. Here, I think, is found another subtle yet withering aspect of practical atheism and it is found more in those persons “in” church rather than those persons “outside” church. God is used as a means for my personal satisfaction and this becomes the only reason that I turn to God. There are tell-tale signs to this in-authenticity on our part: going to church is more about social status than conversion, worship is more about getting my emotional hit than it is about my coming before the living God and gratitude of heart gives way to demand and fear. This brings us to the great gift gained through the authenticity of relationship with the Good Shepherd and it is a gift that cannot be pretended. Either it is there or it is not. When we live in relationship with the Good Shepherd we gain hope and we gain trust. I give them eternal life, and they shall never perish. No one can take them out of my hand. In-authenticity of relationship, practical atheism cannot give this, no matter how hard it pretends that it can. As Scripture tells us; a tree is known by its fruits. We must let these words sink into the soil of our hearts, break apart any hardness that remains there and till the earth that hope and trust may take root and grow! These words are spoken by the one who has risen, the one who has conquered the tomb and the chains of death! I give them eternal life, and they shall never perish. No one can take them out of my hand. Easter creates a new space and a new moment of encounter. No longer are we left abandoned (orphans) in the losses and sorrow of life. The Lord is risen! God abandons no one and neither is God resigned to accept death and lose as the final answer. The risen Lord comes to his friends hiding behind the locked doors of fear, resignation and sorrow. The risen Lord shows them his wounds and by so doing heals their wounds and gives a peace that the world cannot give. It is only though the resurrection that the very wounds and losses of life become places of encounter rather than abandonment. This is the new space and the new moment of encounter created by Easter. We can now meet God in our wounds because God has become wounded and even accepted death for our sake. And God has overcome death! “Peace be with you,” says the risen Lord to his disciples in today’s gospel (Jn. 20:19-31). When he had said this, he showed them his hands and his side. Thomas, we are told, was not there at that first encounter with the risen Lord. Thomas would not believe. 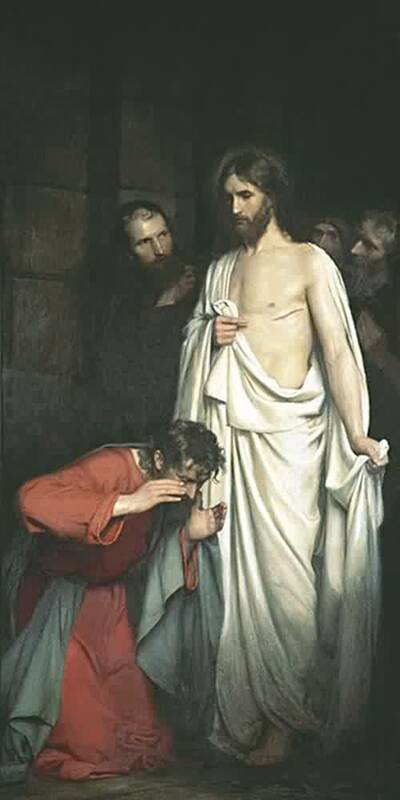 “Unless I see the mark of the nails in his hands and put my finger into the nailmarks and put my hand into his side, I will not believe.” Thomas was not a bad man nor was he a mediocre disciple. Thomas was honest. He was hurting. His love for Christ and his hope in Christ had been crushed by the sheer violence and weight of the cross and the tomb. He was resigned to the belief that death and violence were, in fact, the final answer in this world. Thomas had loved the Lord yet now, seemingly, that love was lost. 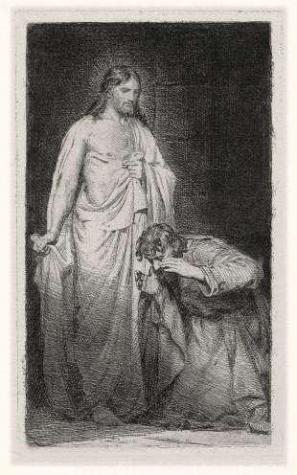 Thomas was left wounded – his heart hurting and hardening. How often we are like Thomas. We are not bad people nor are we necessarily mediocre disciples yet the wounds of life occur and resignation sets in. We sincerely proclaim ourselves Christian yet we hold on to that, “Unless I see…” of a hurting and hardening heart. We seek to be good people, we strive to do right by others, we do honestly love and care yet wounds come and in differing ways we begin to lock ourselves behind closed doors and we begin to accept the resignation of our world. We might proclaim Christ yet we find it easy to live as if Easter never occurred. Today, on this Divine Mercy Sunday, the Gospel proclaims to us that God does not abandon! Death, violence and resignation are not the final answer! New life is possible! Live in the joy and truth of Easter and shake off the false logic of our world! The mercy received through Easter is not a mercy meant to kept locked away indoors. 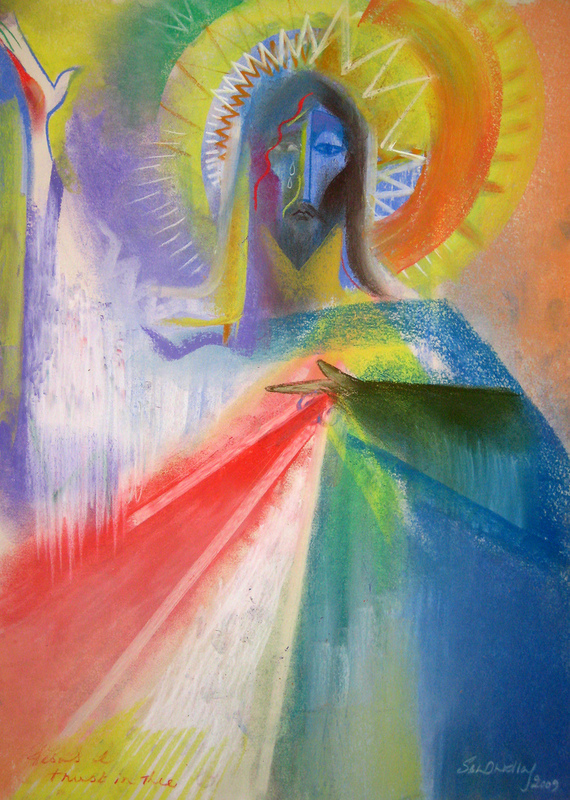 Divine Mercy is a mercy meant to transform the world, beginning with us. We begin to be transformed when we begin to not be resigned. These words spoken to the women by the angel at the empty tomb of Jesus have been echoing in my heart these first days of the Easter season. I believe that the message of the angel has added weight for me this Easter because this coming July 1st I will be moving to Chattanooga to begin a new chapter in my ministry as a priest and I will be bringing to an end my six years as chaplain to the Catholic Center at East Tennessee State University. In the life of Christian discipleship the risen Lord always goes before us and he awaits us just as he awaited his first disciples in Galilee. Six years ago the Lord awaited me here at the Catholic Center after five years of serving as pastor of St. Mary Parish in Athens, TN. I am grateful to God for these six years at the Center just as I was for my time in Athens. I am grateful to God for the ministry that has been built at the Catholic Center these years. I am grateful that we have built a ministry that is solid in our Catholic faith, in community and in service to the poor. I am grateful that the ministry that we have operated out of at the Center is a ministry that is respectful of the dignity and worth of people and that does not need to manipulate people nor ridicule the cherished beliefs of others nor engage in rumors even as so often seems to be the case in our world today. My experience on campus is that despite all the talk about respecting differing viewpoints; people and groups on college campuses are extremely eager to form other people in their own image. I take pride in saying that at the Catholic Center we have sought to respect the image of God found in the person rather than seeking to form the other in our image. Some people might view this deference to the image of God found in the other person a form of weakness worthy of ridicule. I disagree, it is not a sign of weakness. It is a sign of strength, a confident humility, that in the long run shows true respect and care for the other person as a human being. I am grateful for the students who have made the Catholic Center their spiritual home these past six years. I am grateful for and inspired by your willingness to live, wrestle with and witness to your Catholic faith. I honestly believe and hope that you will be leaders in your faith communities one day. To the students who have been committed to the Center and who strive to live your faith while on campus; please know that I will always be willing to help you in any way and at any point that I can. I am grateful for the friends that I have made both within the university community and in the larger Johnson City and St. Mary Parish community. Friendship is a blessing and a source of joy and comfort. I thank God for each of my friends. I am grateful for the years I had with my mother as her caregiver. The last five years of her life were not easy for her or for me to watch and I cannot count the number of times I left Colonial Hills and the local hospital emergency room with tears in my eyes and in my heart but I am grateful that I was able to walk these years with her. Rest in peace Mom. I am grateful to the Community of Sant’Egidio who continually teaches me to find Christ in the Gospel and in the poor. I am grateful to my friends at the John Sevier Center. Over and over again I have seen Christ in their faces and they have taught me about faith, trust, hope and friendship. I look forward to living the charism of Sant’Egidio in Chattanooga and to friendship with the poor there. I am grateful for Fr. Christian Mathis. He is a good friend and good priest and I know that he will bring an energy, enthusiasm and love to this ministry of the Catholic Center. I am hopeful that he will take the Center ministry to the next level. I am grateful to Bishop Richard Stika who is now calling me to Chattanooga and I am grateful to the gift of obedience. Eighteen years ago on my ordination day I promised obedience to the Bishop of Knoxville and ever since then I have experienced again and again that obedience is a font of unexpected graces and growth in life. I am hopeful for this new call to serve. Six years ago, Christ awaited me at the Catholic Center at ETSU. Now, Christ awaits me in Chattanooga. The joy of discipleship is found in following Christ wherever he might lead. Easter Sunday concluded … now what? 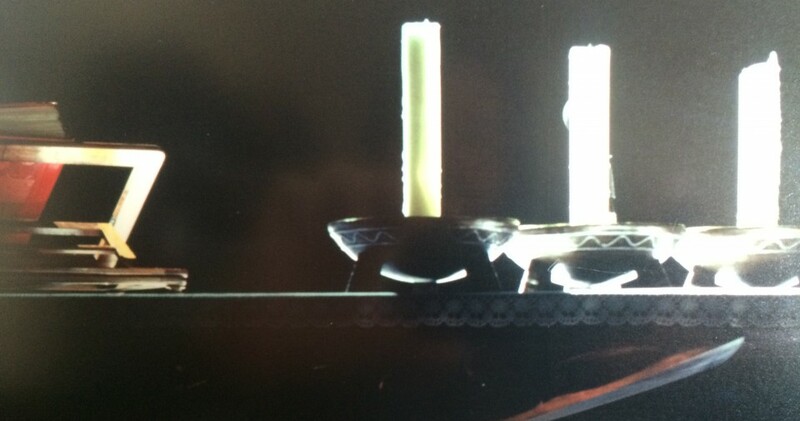 It is now the quiet time… The Triduum services are completed. The Easter Vigil (the “mother” of all vigils) has been concluded for another year – to varying degrees of liturgical success in each individual parish I am sure. The crowds that seem to magically appear and arrive for Easter Sunday Mass have come and gone. Candidates and catechumens have been received into the Church. Easter Egg hunts are wrapped up as well as family Easter gatherings. Now what? Is Easter Sunday, 2013 to now be shelved away as a nice memory testified to by photos posted on facebook? An opportunity for people to dress up and have good family time? Does the message of Easter end with the last Easter Sunday Mass? Liturgically the Church says “no”. We have the Easter Season – a needed time to reflect on the truth of the resurrection and to look to the coming of the Holy Spirit at Pentecost. “Liturgical” here is important and it does certainly influence who we are but here I am specifically wondering about our day-to-day life outside the parish walls. Does Easter affect and shape who we are or does it remain a beautiful annual ritual that is left behind in the crowded Easter Sunday church parking-lot? Do we take Easter with us into the streets of our lives and of our world or do we keep it hidden away behind locked doors – doors of a private faith, spirituality and morality, doors of our resignations and sense of hopelessness in the face of the pain of our world, doors of our fear to offend the accepted norm. Easter cannot stay hidden away. Easter demands that we go into the streets – no matter how uncomfortable it makes us or others. 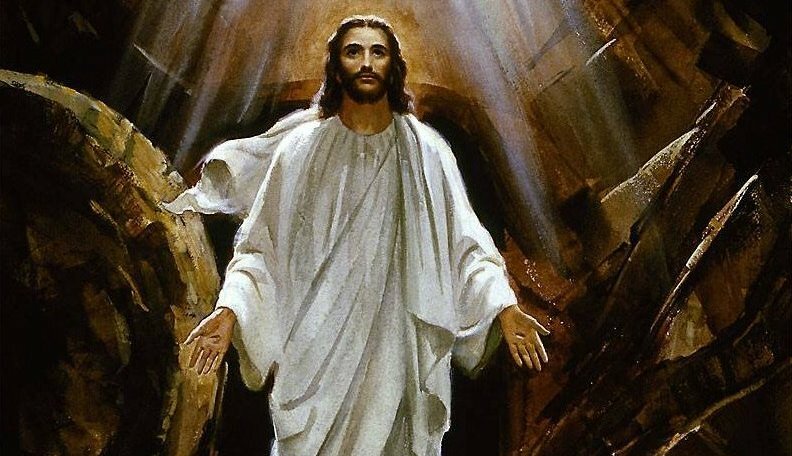 The resurrected Lord does not fear the world and its violence and sad resignation because he has overcome all the sin of the world through the love of the Father. The resurrected Lord goes before you to Galilee. He goes into the streets of the world and the expectation and instruction given by the angel of the resurrection is that the followers of Christ do the same! Easter, if it is to be authentic and be more than a nice memory, cannot stay hidden behind any locked door and neither will it allow us to remain hidden. There is a culture of fear that continually whispers to us that nothing can change, that we cannot really do anything in the face of the injustice of our world, that we should look upon ourselves and our world with hopeless eyes. The culture of fear is arrogant in its pride and thinks that it alone has words to speak. The culture of fear lies. The culture of fear would convince us that we are its children. We are not children of the culture of fear. We are children of the resurrection! We are sons and daughters of God! We have nothing to fear and we have words, new words to speak to our world and to one another! 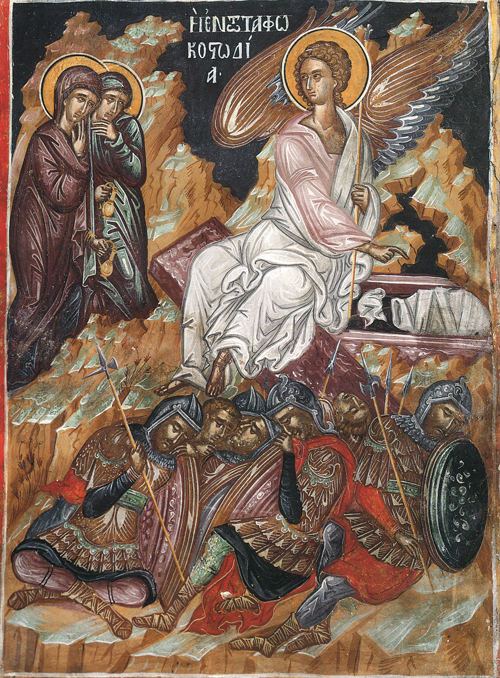 The angel announces that the risen Lord is going to Galilee and that there the disciples will see him. The implication is more than apparent, the disciples are meant to go and meet the Lord who goes ahead of them. (The Lord always goes ahead of us.) They are meant to go out into the street and carry the truth of the resurrection into the world! It is not enough to stay behind locked doors, no matter how pretty and gilded those doors may be and no matter how many other people may also be content to remain there also. If we do so then the culture of fear wins and our lives become exceedingly small, constrained and life-denying. 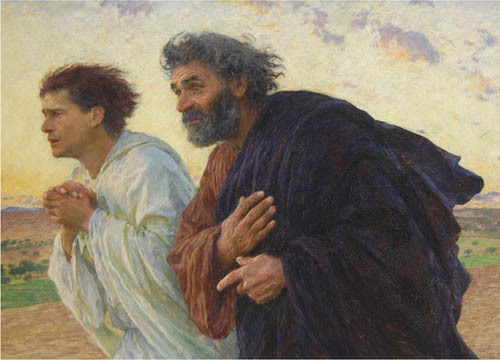 Joy is found only in following the risen Lord to wherever he might lead. One further thought: there is no time to waste. The angel instructs the women: go quickly. We are each allotted only a certain number of Easters in our lives here on earth. There is no time to lose, both for the work needing to be done in our own hearts as well as the work needing to be done in our world. In the light of the resurrection we must make use of every moment given to us. When all is said and done, we will each have to give an accounting of how we have lived the Easters we have been given in our lifetime. We are sons and daughters of the resurrection of our Lord! The Easter mystery is placed in our hearts and entrusted to us and it cannot remain behind locked doors, it demands to be taken out to the streets of our world!